Gold crowns and bridges with accuracy never before available in the industry. Save time and money with less hassles and our unprecedented remake guarantee. Become a valued Strategy Milling customer today. Attach your valid prescriptions for production. View our map to locate a lab in your area. At Strategy Gold Milling, we believe these are basic tenets in manufacturing excellent dental restorations. Comparing gold restorations that are direct milled using a digital workflow versus either the CAD Cast or analog workflow, is like comparing apples to oranges. These processes have different numbers of steps, with different levels of opportunity for problems or distortion between those steps to occur. These extra steps create opportunities for failures which simply don't exist in the direct milled, digital workflow. Strategy Milling has developed a process to create virtually porosity-free pucks of noble and high noble gold alloys to mill from. The accuracy and repeatability of the milling process is outstanding using our state of the art milling machines with tight tooling parameters. Milling eliminates the many issues related to spruing, burnout, and casting; providing predictable, as well as fast results, needing far less manual labor to create or finish. 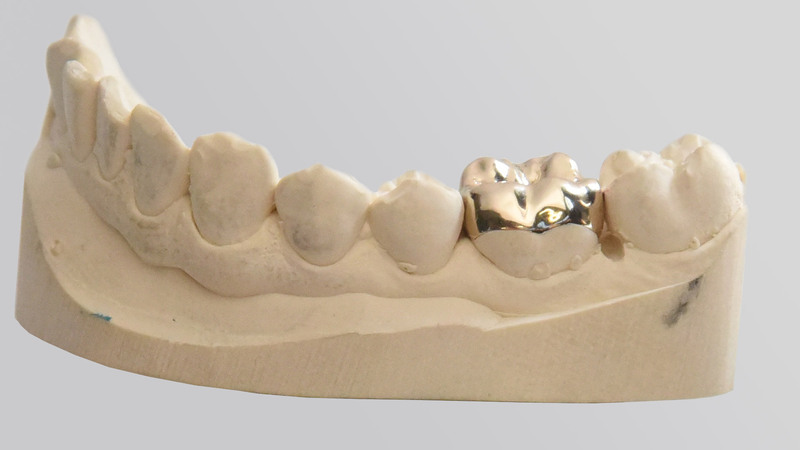 Using Röders RXD5 mills, Strategy Milling produces milled full contour gold crowns and bridges superior in quality to restorations manufactured using the lost wax and cast method. 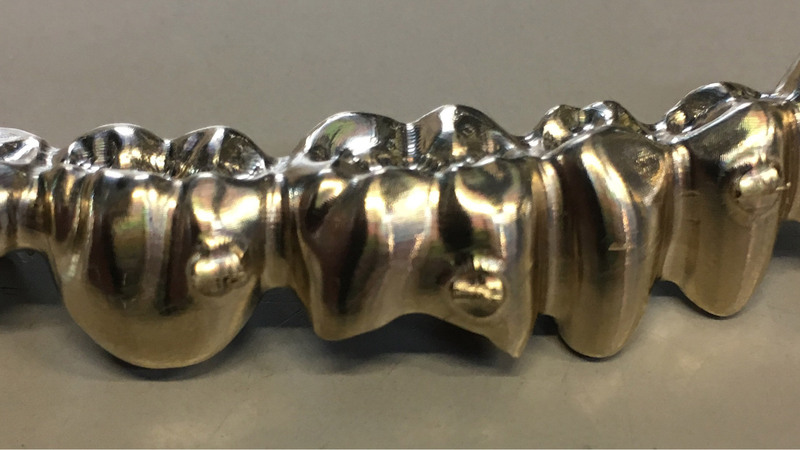 Since January of 2011, Strategy Milling has been researching and developing direct milled CAD-CAM full contour gold crowns and bridges, as well as PFM substructures. All products are proudly made entirely in the USA. We are excited about the incredible quality of milled restorations from Strategy Milling. Now in our 66th year as a dental laboratory, we were early to incorporate CAD CAM technology in our work-flow. 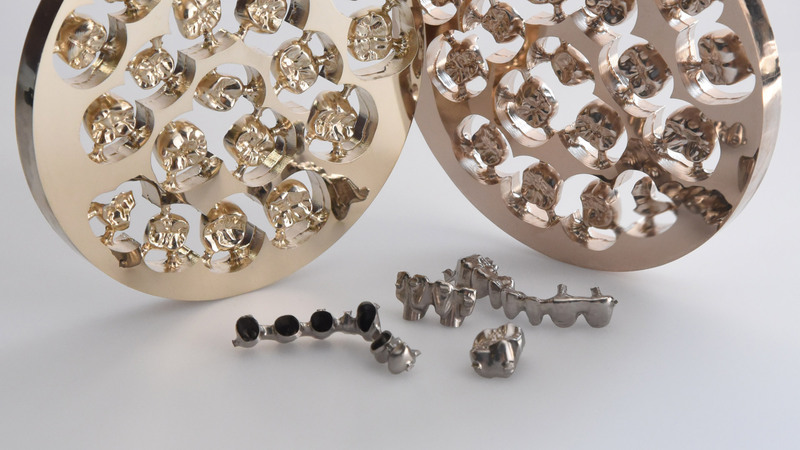 Milled restorations from Strategy Milling are a perfect complement to our 3D printed cast and SLM products. They have opened a new chapter in our long history! Strategy Milling allows us to work full contour gold crowns into our digital production schedule, providing a superior restoration in less time. This saves our doctors chair time! When Caruso Dental Lab started using Strategy Milling for gold crowns, our average seat time decreased to less than five minutes. We are very focused as a Laboratory on our CAD/CAM work flow and how it improves our ability to serve our clients, and now with having the ability to offer a traditional FGC, manufactured through a digital process is very exciting. We have been continually impressed with the quality of milled restorations. No more porosity or compromised castings. Thank you, Strategy Milling! Site created by Action Creative.